While most of us can’t even stand on a surf board, let alone ride through a wave. 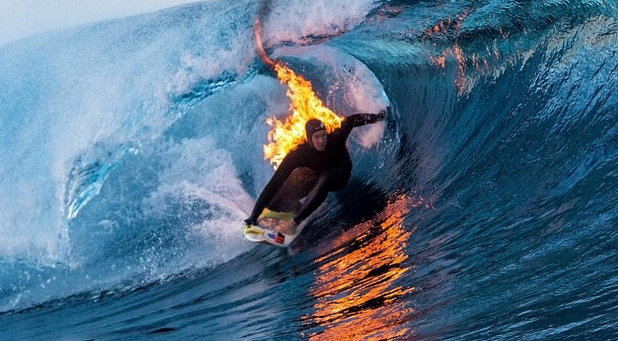 This pro surfer-turned-stuntman, Jamie O’Brien (“JOB”), decided to light himself on fire while riding some fierce waves in Tahiti. JOB has recently gotten a TV series sponsored by Red Bull called, “Who Is JOB 5.0.” This wild antic was apparently filmed as part of that series. The stunt itself took place in Teahupoo, which translates to “broken skulls” in Tahitian. Seems like a pretty ballsy move to light yourself on fire, going through a wave that is infamous for it’s steep, powerful nature. These waves tend to crash over a shallow reef also that can cause broken limbs. It’s safe to say though that JOB made it out without a scratch and has some amazing photos and apparently video to go along with the stunt. Can’t wait to see the show. Check out the photo and video below.